Kudos to @Lafarge on your "Desecrating the NFL" series, you've really inspired me to force myself to take more risks and be more bold with my hockey concepts. Most of my uniform designs tend to be conventional and traditionally sound based off of the team's history. So I began this series with the goal in mind to reach a little bit out of my comfort zone design-wise. This concept series will follow the same rules as Lafarge's "Desecrating the NFL" with a few added notes. 1. The uniform must be brand new. The design may never have been worn previously by the franchise. 2. A team's uniform must be "drastically different." i.e. Obviously different to the average person on this site. 2a. Teams must also have a unique design element that sets them apart from the rest of the league. 3. Elements may be taken from current or former uniforms, and may be mixed and matched, so long as a new uniform is created. 4. Logos remain the same. This is mostly a uniform project. 4a. 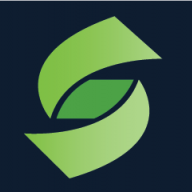 Logos can be recolored or slightly modified, but there may not be any new logos used. 5. Each team will have a primary colored jersey (home), a primary white jersey (road), and an alternate, third jersey. There's no real order to the team's I will be posting, but I am open for suggestions as for who to post next. This looks really promising. Calgary's look is amazing. Only thing I'm not sure about is the yellow and white being together. Looking forward to the rest of this series! Wow, that's a hot set coming right out of the gate! Home: I love the darker red and the complete removal of white striping from the red jersey. It actually makes me like the white Flaming C (which IMO looks terrible on the classic flames red throwback). The lack of white elsewhere makes the C pop. Road: A good continuation of the home jersey's basic patterns. I think extending the yoke a bit and rounding it off would make it great. Alternate: Too much black. 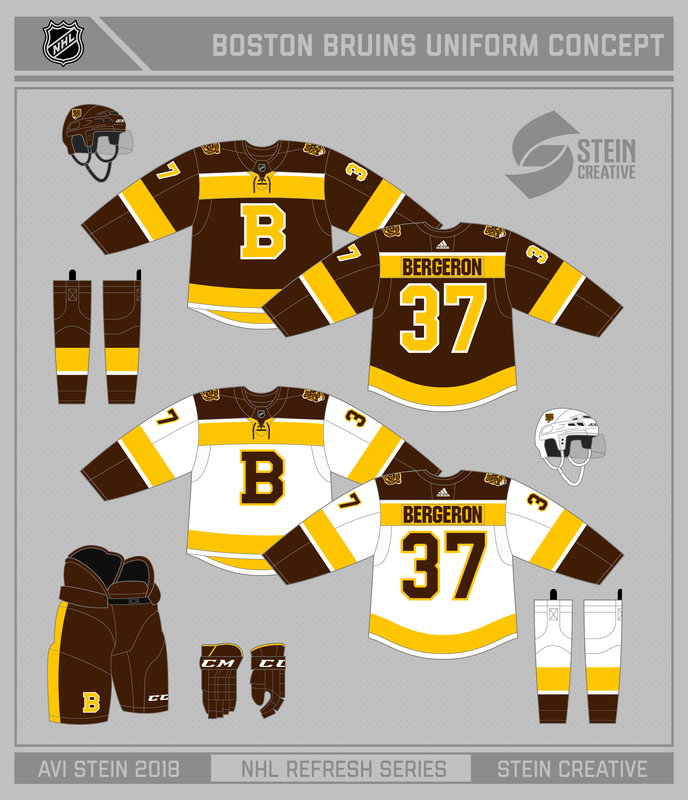 On the home jersey, the lack of white was a plus. Here, a bit of white striping is needed. And maybe swap the use of yellow and red. 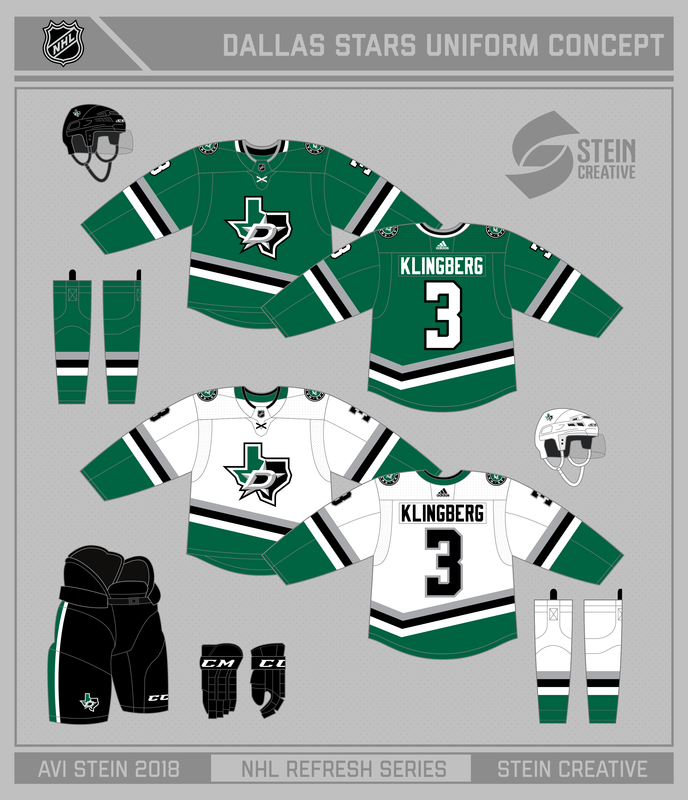 Overall, a great stab at a set of jerseys that no one seems to be able to get right. Love the home and road. Darker red is fantastic and agree, the logo really pops now. The alt reminds me of the Cavaliers newer alternate (whatever they call it). I think maybe if you made the bottoms of the arms and hem red it'd give it a little more... I dunno. Something. Could also make the bottom parts of the pant stripe red. I applaude you for not embracing the retro colouring. That retro red badly needs black to compliment it or it looks cheesy and dated. This colour red, and yellow, stand great on their own. I would put a white "C" with red outline on the alts, and do the same with the font , but that is the only thing that I'd change. Well done. Forgot to mention, I like your treatment on the collars. 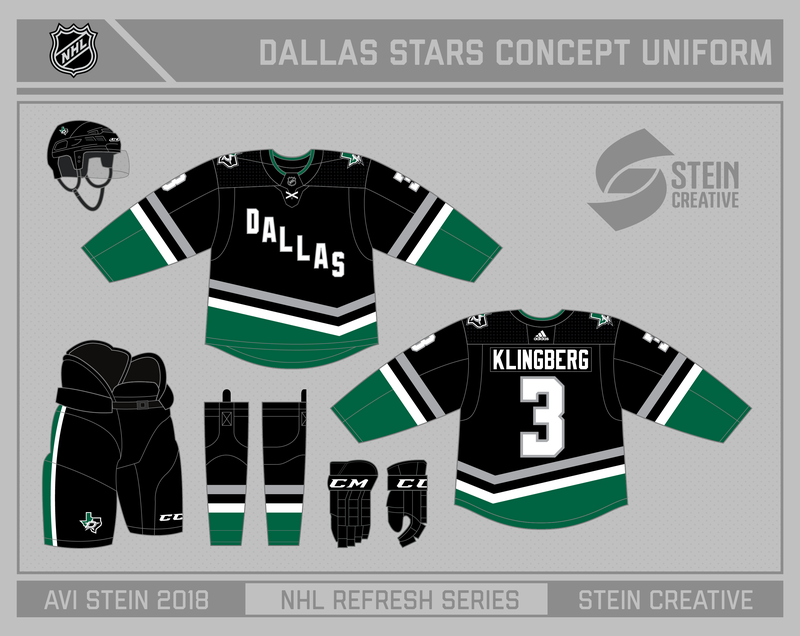 I don't know why more teams other than Dallas haven't used the two-part coloring on the back half of the collar but you use it well here. Welcome to the club, good sir! I'm excited to see what sort of debauchery you can come up with! I really like this Calgary concept. It's pretty down to earth, but definitely not something the Flames have suited up in before, which as you stated yourself is the main goal. I've always been a big proponent of darkening the red/gold color scheme in some way, and the maroon is a good way to go without using black. I also like the subtle reference to the pedestal uniforms in the pants striping. One critique I do have: On the alternate pants, I think it would be more consistent (and better looking in general) if you were to add a red stripe in between the bottom two yellow stripes. That would improve the consistency between the stripes on the rest of the uniform (obviously this isn't a problem on the red shorts). Overall a solid start! I'm excited to see the Original 6 get torn up! That’s possibly the best Calgary concept I’ve ever seen. How would the home look without any white, only burgundy-yellow? Very interesting idea, looking forward to seeing this series play out. Calgary’s home and away look great, though I’m not too sold on the alternate. Presentation is great as usual. 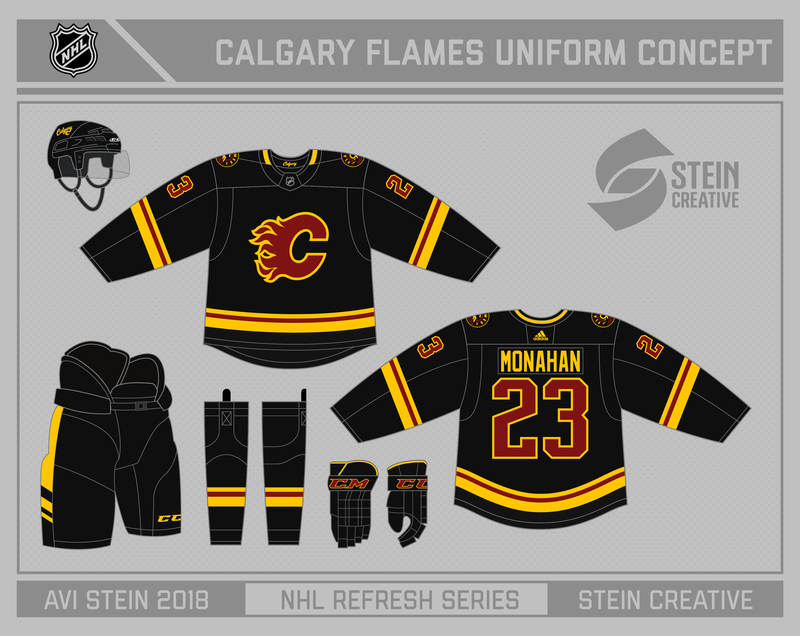 For Calgary, I think that those should be their uniforms, if they decided to throw it back full-time, while looking towards the future. 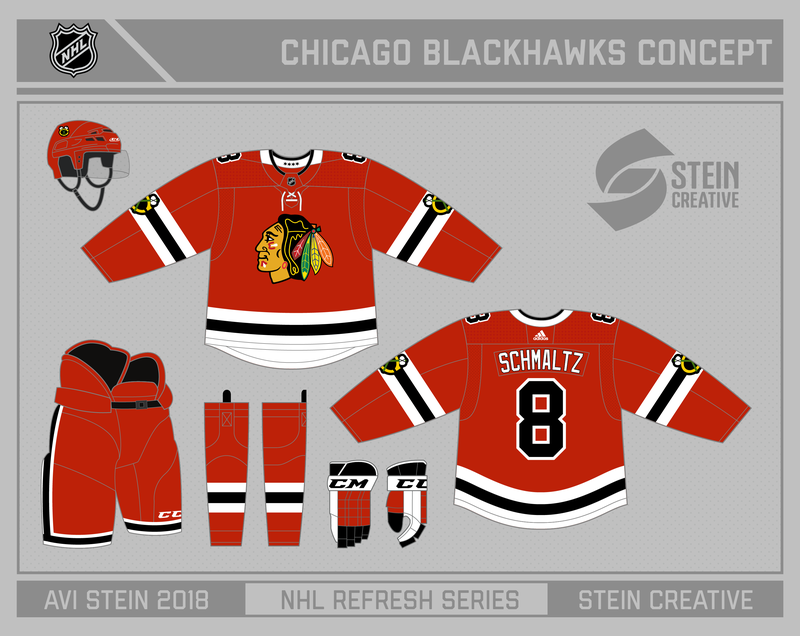 For Chicago, that set somehow desecrates part of their tradition, especially that all-red uniform, but, don't get me wrong, it still looks traditional and clean. Great work on both teams! Perfect. I wouldn't mind if they adopted this full-time. Chicago isn't too bad of a desecration, looks good overall. 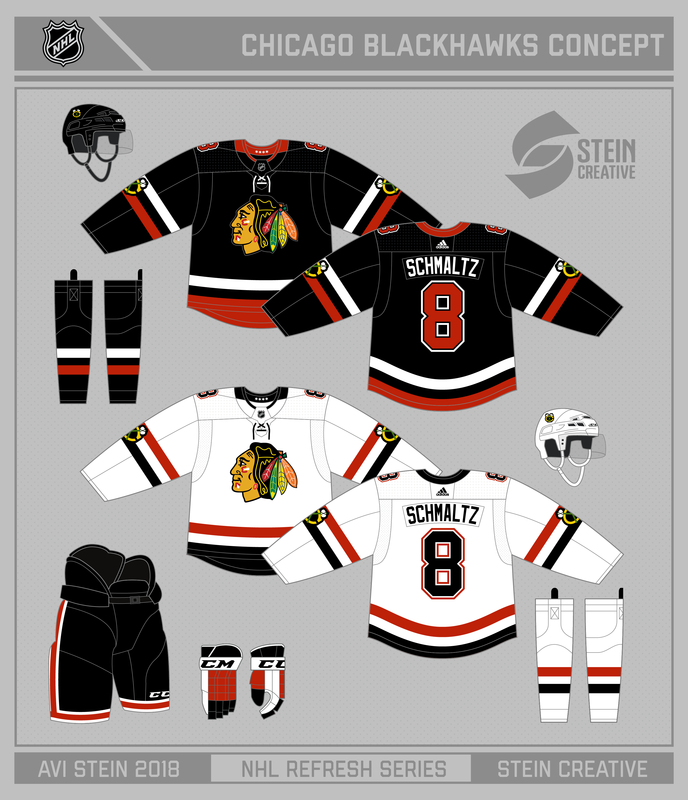 For some reason I feel like it aligns them a bit more with the Bulls, and you have a bit of classic Hawks with the tomahawks on the arms. 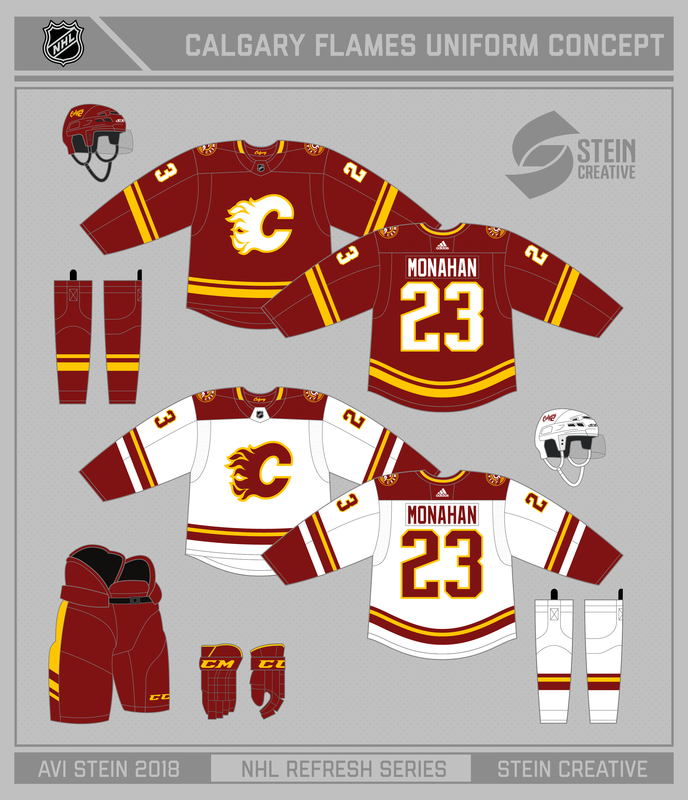 I never knew I wanted Calgary in Maroon and Yellow until I saw this concept. Can’t wait to see the rest! Not bad. 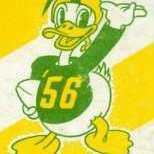 But since the point is "desecration," can we see a version where the C-hawk replaces the chief as the main logo? Sorry, I am not going back and changing my concepts. If it was a small revision/execution error that is a different story, but I used the chief logo as the primary for a specific reason. These all look great; I especially like Calgary's black jersey. One nitpick, though... if I were you, I'd refrain from any of those toilet-seat collars. I'm taking my time looking at Boston. I like it a lot. Great decision with the B logo. Loving the brown and gold sets. The only thing I think might improve the balance on the road jersey is putting a brown stripe right above the gold on the hem. I see how you're keeping the consistency between each jersey but it just seems off balance. Perhaps if I saw it on a player with the pants bringing it together I'd say something different. Good eye on that, what I was trying to do was actually incorporate the pants as part of the striping so that it stays consistent with the design on the arms. I don't have a good player template to use (the one I made is pretty outdated), but one of my goals is to make a newer one. 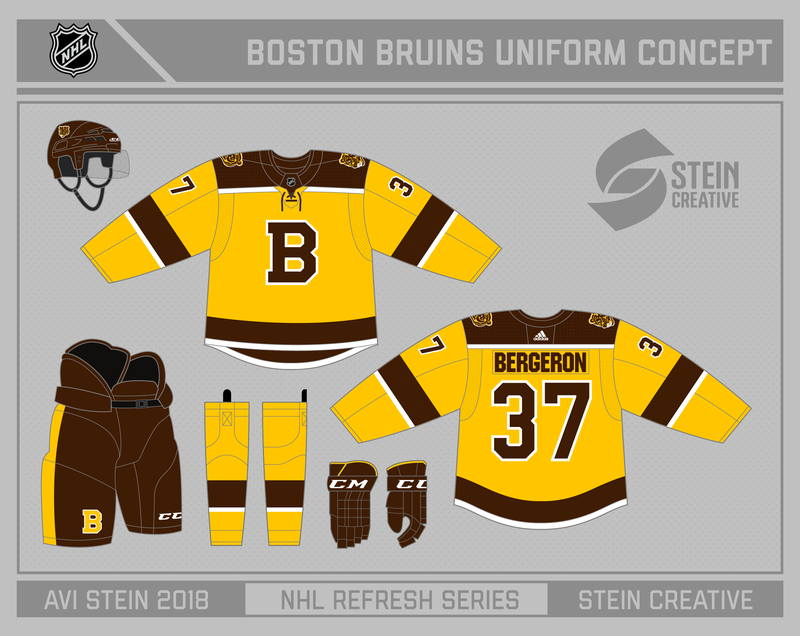 So once that happens, I'll be sure to post it here adapting it to this Bruins concept. edit: I'm having some trouble uploading pictures to imgur......once that's resolved, I'll post the next team!